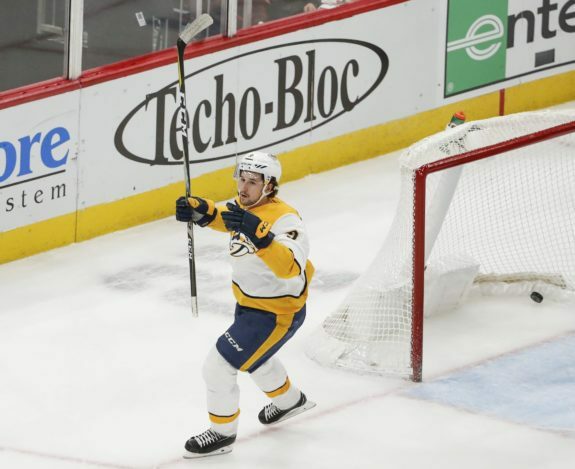 CHICAGO — Filip Forsberg scored a minute into overtime for his second goal of the game, and the Nashville Predators beat the Chicago Blackhawks 4-3 on Wednesday night for their third straight victory. Colton Sissons and Viktor Arvidsson also scored to help the Predators improve to 3-0-1 on a six-game trip. Ryan Johansen and Mattias Ekholm each had two assists, and Pekka Rinne made 28 saves. Nashville had a 3-2 lead before Patrick Kane flipped a pass into the middle to Artem Anisimov, who slid a shot under Rinne with 2:21 left in regulation. Anisimov stopped a seven-game drought with his eighth of the season. But Forsberg stepped up in overtime, driving to the net and flipping a shot over Collin Delia's left shoulder for his 16th of the season. Forsberg just returned to the Predators' lineup on Monday after missing 17 games with a hand injury. [caption id="attachment_499830" align="aligncenter" width="575"] Nashville Predators Filip Forsberg celebrates after scoring the overtime winners against the Chicago Blackhawks (AP Photo/Kamil Krzaczynski)[/caption] Chicago lost for the fourth time in five games. Alex DeBrincat and Jonathan Toews also scored for the Blackhawks, and Kane had two assists. Nashville jumped in front on Sissons' ninth of the season, but Predators defenceman Dan Hamhuis was sent off for hooking 17:03 into the first and the Blackhawks capitalized on the power-play opportunity. DeBrincat extended his goal-scoring streak to three games when he drove a cross-ice pass from Kane under Rinne's stick for No. 21 on the year. The tie lasted all of eight seconds. Arvidsson got a stretch pass from P.K. Subban, avoided Delia's stick and stuffed home a backhand to make it 2-1 Predators with 2:01 left in the period. Nashville increased its lead to 3-1 after Chicago defenceman Connor Murphy was penalized for hooking in the second. Forsberg beat Delia with a wrist shot at 16:26 for his first goal since Nov. 21. The Predators got another power-play chance after David Kampf was whistled for tripping late in the period. But Toews got a nice pass from Marcus Kruger and sent a shot by Rinne on the stick side for just the fourth short-handed goal of the season for the Blackhawks. NOTES: Sissons matched his career high for goals. He also scored nine times in 81 games last season. ... Blackhawks D Brent Seabrook was scratched because of an illness. ... Blackhawks D Gustav Forsling was placed on injured reserve with an upper-torso injury. The move was made retroactive to Saturday.